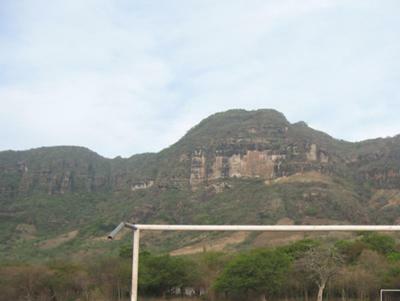 HOLA SOY DE MI QUERIDO PUEBLO DE OROCUINA HOY QUIERO MOSTRARLES EL CERRO DEL ZAPOTILLO CERRO QUE SEGÚN LA HISTORIA ES LA TERMINACIÓN DE LA CORDILLERA DE HIERBA BUENA QUE ES DONDE NACE EL RÍO CHOLUTECA, ADEMAS AHÍ SE ENCUENTRA LA PIEDRA A LA QUE NOSOTROS LE LLAMAMOS "PIEDRA DEL DIBUJO" POR QUE EN ELLA SE ENCUENTRAN ALGUNOS DIBUJOS INFRUSTRADOS, ADEMAS SE ENCUENTRAN LAS CUEVAS. ESTO TODO AL FRENTE, AHÍ LO PUEDEN VER EN LA FOTO QUE HE SUBIDO, UNA VES SUBIENDO A LA SIMA DEL CERRO SE PUEDE VER LA CIUDAD DE CHOLUTECA COMO TAMBIÉN VER EL MAR EN CEDEÑO Y LOS VOLCANES DE EL SALVADO Y DE NICARAGUA. TAMBIÉN PODEMOS ENCONTRAR LA FAMOSA CUEVA HEDIONDA QUE NOSOTROS LOS NATIVOS NO SABEMOS CUAL ES LA RAZÓN PERO LO CIERTO ES QUE AL RATO DE ESTAR EN EL LUGAR SE EMPIEZA A SENTIR EL MAL OLOR SEGÚN LOS NATIVOS ENTRE MAS RUIDOS SE HACEN EL OLOR ES MAS FUERTE. ADEMAS PODEMOS ENCONTRAR EN DICHO CERRO INMENSA CANTIDAD DE ANIMALES, COMO VENADOS COLA BLANCA, MAPACHES, GUA-TUSAS, TEPESCUINTES, Y UN SIN NUMERO DE CULEBRAS Y HAY MUY GRANDES. SALUDOS Y ESPERO LA PRÓXIMA VEZ PODER SUBIR FOTOS DE LOS DIBUJOS DE LA PIEDRA QUE LES COMENTO.